In a surprise move, Apple has launched its iPad mini with Retina display in the Apple Online Store, where the new iDevice is available to purchase from $399. The news hit hours ago that Apple could be planning on a Nov. 12 launch for its Retina-equipped small-size tablet, and soon after the Apple Online Store went down in countries spanning the globe. Now, the virtual store is back, and Apple's anticipated iPad mini with Retina display can be ordered online. 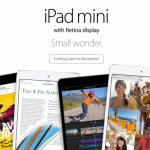 It seems that a number of countries are able to access the iPad mini with Retina display in their local Apple Online Stores, despite long-standing rumors indicating that the product would be in "short supply." 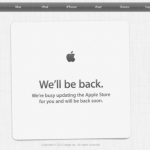 Of course, as of this writing it would appear that Apple is offering its new iPad mini in the Apple Online Store only. Furthermore, shipping times for the iPad mini with Retina display aren't so positive: Apple estimates one to three business days for the 16GB and 32GB Wi-Fi only models, and five to 10 business days for all other iterations of the second-generation small-size tablet. In international territories, where most iDevice users are already awake, these estimates are rapidly being increased. We'll update this article with more information as we receive it. In the meantime, see: Epic Post-Apocalyptic Robot Combat Cover Shooter Sequel Epoch 2 Coming Soon To iOS, Apple's Online Stores Go Down Ahead Of Retina iPad mini's Rumored Nov. 12 Launch, and Apple Reportedly Set To Launch iPad mini With Retina Display On Nov. 12.